My Official Preconception: "This is, I think, an installment of the Batman franchise, which was all the rage when I was in college. Ho hum. " 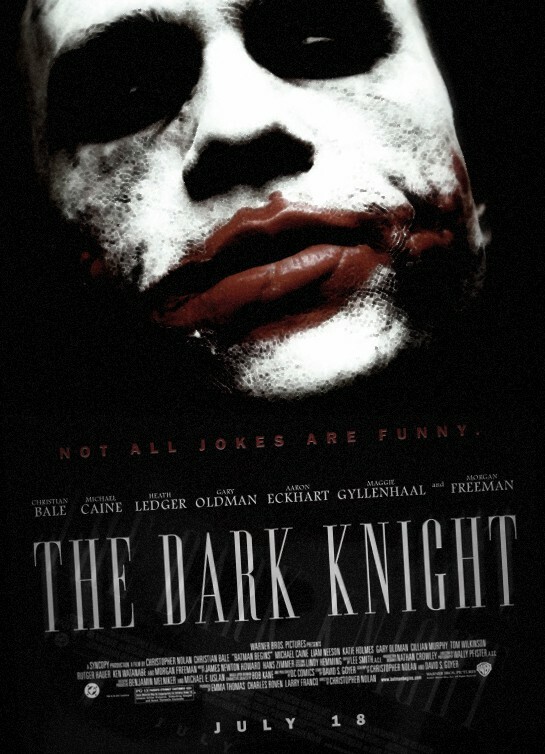 The Dark Knight is indeed another movie adaptation of the Batman comics character. The cool kids (among whom I like to think of myself, no matter what you say) like Batman best among the pantheon of Superheros because he is considered "dark." Nolan (who directed the excellent 2000 Memento) takes the darkness quite literally in this case, and although heaps and heaps and heaps of money were obviously lavished on production and effects, it's a pity that a little more wasn't spent on lighting so that one could consistently see what's going on. As an action-adventure movie, Dark Night is the expected fiesta of chases, fights, explosions, amazing luck, and violations of physical law. That's all fine and good; that's what action-adventure is, for better or worse. Knight is badly marred, unfortunately, by a stern air of solumnity and import that is completely unsupported by what is, even for the genre, a dumber-than-usual plot. There are some amusing scenes involving Morgan Freeman as Bond's Q -- oops, as Batman's provider of high-tech vigilante solutions -- but all of the other actors seem to have been instructed to utter their lines, a bizarre proportion of which are gobbledygook about "what kind of hero Gotham City deserves," with the most preposterous earnestness at their command. Somewhere along the line, somebody forgot that the purpose of a comic book character is to entertain. It is a sort of achievement that a movie this noisy could also be so boring. Prognosis: * 1/2 -- Two and a half hours that aren't coming back. I finally watched this a mere 3 weeks ago. I enjoyed it, but I watch so few action movies that I think they're all fun. I like the Joker's little speech where he's dressed up as a nurse and he's complaining about schemers and he says "I just ... *do things*". I sympathize. I also disliked the seriousness-- I actually laughed out loud several times when Batman talked in his gruff. serious. stacatto. Not one little mention of Heath Ledger as The Joker? I thought he was riveting in that role.